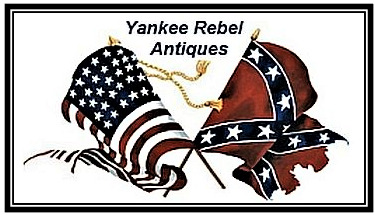 I publish the monthly Yankee Rebel Antiques Newsletter that is always on a Civil War topic such as battles, notable persons, collecting, etc. This goes out to all of my customers via email and I receive many compliments on its content. If you haven't been receiving the newsletter, or know of someone else who may be interested in receiving it, just drop me an email and I will add your name to the list (don't worry, I do not share emails with any other person or business). The Civil War Canteen was my first published book back in 2007 and now I have the updated version available The Civil War Canteen - Second Edition, which has been meticulously redone along with many new additions and over 225 photographs. Battle of Gettysburg - The Relics, Artifacts & Souvenirs was published in 2008 in an all-color version. As with the canteen book, I have totally revised it with higher resolution photographs, new layout, and many new additions and now has over 725 photographs, 174 pages and a full index. In addition to the full-color version, it is now available in black and white (color covers). I also have my first children's book published, titled Children at the Battle of Gettysburg - Their Unforgettable Summer. This 65 page book is fully illustrated. Although a fictional story, it is based on fact and is a great learning tool for the younger ones. In 2013 I wrote Civil War Artillery - A Pictorial Introduction. It has over 550 photographs. It gives the reader a feel for what it was like to serve with the artillery during the Civil War. You will find many rare and previously unpublished photographs along with personal stories, battles and the role the artillery played during the Civil War. My latest project is The Civil War Soldier - His Personal Items. This project took almost two years to complete. As with my other books, it is loaded with photographs of many rare and unusual items which were carried and used by the Civil War soldier. It has almost 600 photographs and a full index. I feel this is destined to be the "Go To" book when researching and identifying these unique pieces. In 2018 I published "The Civil War Canteen - Third Edition". In this 145-page full-color book, there are over 225 canteens accompanied by 175 photographs of canteen-related artifacts, soldiers, and Civil War battlefields. My books are on the website with more details and can also be found on YouTube videos. They are available in historical areas such as Gettysburg and Fredericksburg, as well as the major book suppliers, such as Barnes & Noble, Amazon, Abe Books, etc. Also, directly from the publisher www.lulu.com/spotlight/civilwarbooks However, if you would like your copies signed and personalized, you can order them directly from me via the website. I am sure that many of you subscribe to or are familiar with the magazine North South Trader's Civil War. It was founded in 1973 and is considered the predominant publication for the Civil War collector and historian. Over the years I have written several articles for them and in Volume 36, #1, 2012, I have the feature article titled "Exploded Fort Huger Cannon". It is based on the Confederate fort in Virginia and its role during the war, along with one of its original exploded cannons which I have in my personal collection. This subject is also discussed in my artillery book. Original Civil War and quality 19th century artifacts have been increasingly difficult to come by. With many years of dealing with collectors, museums, diggers.....and people who are just generally interested in history, I have developed quite a few resources. This allows me to pass along both the common and rare pieces to your personal collections. Every collector has their own preferences when it comes to Civil War items, but I strive to accommodate just about everyone’s interest. I myself have always had a great interest in Civil War canteens and just about anything Gettysburg. Also, I am always interested in purchasing, if you have an item (or items) to sell, drop me an email. If you are looking for something that you do not see on my website, let me know, perhaps I have it available or can help you find it. Checks, money orders, PayPal and credit cards through PayPal, are gladly accepted. Please drop me an email at Bob33rd@optonline.net I will let you know the availability of an item, the shipping charges and details for paying.